If you’ve ever shopped for beer, wine, or spirits in Kentucky, chances are you’ve visited a Liquor Barn store. It’s the largest independent chain of alcohol retailers in the state and boasts some of the largest and most elaborate bourbon allocations in the world. Founded in 1984, the chain was family-owned until 2009, when it was acquired by a publicly traded Canadian company. In November 2017, Liquor Barn once again found itself under new ownership, when the Louisville-based private equity firm Blue Equity, LLC purchased the 15-store chain. Now that Liquor Barn is once again a Kentucky-owned company, a plethora of new resources are on hand to help elevate this powerhouse chain to the next level. Blue Equity is no stranger to the alcohol retail industry. Two years prior to purchasing Liquor Barn, the firm acquired two Party Mart stores, which sell wine, beer and spirits along with an assortment of party supplies. Now all of these stores operate under the Blue Equity umbrella, giving them access to corporate resources they never had at their disposal before. Blue says that his firm was drawn to Liquor Barn because of the company’s long history of operating in the Kentucky market. He adds that Liquor Barn’s prime locations (six stores in Louisville, six in Lexington, and one each in Danville, Bowling Green and Elizabethtown) make them top destinations for consumers. Together, Liquor Barn employs nearly 300 people, and several of its largest locations are 35,000 to 40,000 square feet, allowing it to carry more products than most competitors. “We literally can’t keep bourbon in stock, and the best way we can truly serve our customers is by our size and expansion,” Blue says. As a result of the acquisition, Liquor Barn is now positioned to evolve in ways it never could before. 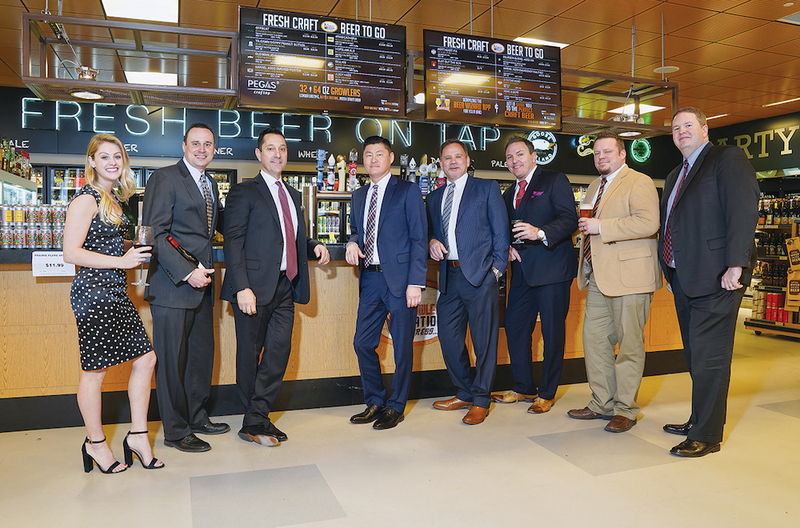 Marketing and Events Manager Molly Alviar, Wine Manager Tyler Mirt, Middletown location GM Jacob Bush, SVP/COO Chris Edgerton, Senior Partner Vince Rosenblatt, Tobacco Manager Jason Lois, Beer Manager Brian Price and Sr. Director of Merchants and Product Dev. Brad Williams. Liquor Barn’s move to Blue Equity is just the latest example of how grounded the company is in its home state. Perhaps the most unique aspect of these stores is how so many components of the business have a local flavor. Spirits are by far the top seller across all store locations. That’s generally synonymous with sales across all Kentucky retailers, which lean enormously toward bourbon and other “brown juice,” as dark spirits are affectionately called. Local products make up a large portion of inventory across categories, and they’re also top sellers among consumers. At any given time across all locations, the top 10 best-selling craft beers are all sourced from Kentucky breweries. The same trend is apparent in wine, where two or three varietals from Kentucky or neighboring Indiana are always among each week’s 20 best-selling bottles. As for spirits, Kentucky bourbons constantly surpass all other spirits in total sales volume. Although local products are a main feature at Liquor Barn, the company is also known for being a destination for consumers looking for a very carefully cultivated selection. Retailers that have such large stores have to work even harder to make sure they’re not simply cramming excess product on the shelves: every item is carefully selected based on consumer demographics, specific customer requests and current trends. Brian Price, a Certified Cicerone and Beer Merchant for Liquor Barn, reports that while IPAs are still a customer favorite across the state, he’s seeing a small shift toward old-school German lagers. Gose and sour beers are also gaining in popularity, particularly among female consumers. Stouts are losing a bit of momentum, while porters seem to be experiencing a resurgence. Price says it’s extremely fun to engage with Liquor Barn customers who embrace so many different types of beers. The local enthusiasm extends to the wine category, which has seen an influx of bourbon barrel wines along with many sweet wines. Tyler Mirt, a CS, CSS, and Cicerone himself, as well as Liquor Barn’s Category Merchant for Wine, reports that rosés have also become much more popular over the past two years. The constant consumer demand for new varietals is also something Liquor Barn strives to meet. While bourbon makes up the largest portion of the spirits category, Liquor Barn has noticed some other growing segments as well. Brad Williams, Senior Director of Category Management and Product Development, reports that tequila has been the fastest-growing spirit category for the past two years, followed by cognac and brandy. Similar to the wine category, Williams says that sub-premium and lower-price spirits aren’t performing as well as mid-priced bottles. “I think that’s really a testament to how our educated staff is lending itself to a great consumer experience, and customers are naturally learning more about product selection from our employees,” Williams says. In addition to selling wine, beer and spirits, many of the stores also feature vast food selections – which are also locally-centric. Along with offering many Kentucky cheese products, Liquor Barn stocks other gourmet food options including pastas, specialty sauces and sausages, many of which are made in-state. Other product lines include standard and customized gift baskets, specialty apparel, candles and even artwork. One area of business that the company is looking to expand is its bottle engraving program. This is something that is extremely popular at Blue Equity’s two Party Mart locations, and because Liquor Barn and Party Mart now operate under the same management, there is an opportunity for segments of the business to learn from each other. “We’re really focusing on how these brands can grow and evolve together, and feed off of each other’s successes,” says Chris Edgerton, Senior Vice President and Chief Operating Officer of Liquor Barn. Since being acquired by Blue Equity, Liquor Barn and Party Mart’s management teams have slowly begun to integrate. Additional collaboration efforts between these two teams are expected to roll out later in 2018. Although local products are a main feature at Liquor Barn, the company is also known for being a destination for consumers looking for a very carefully cultivated selection. 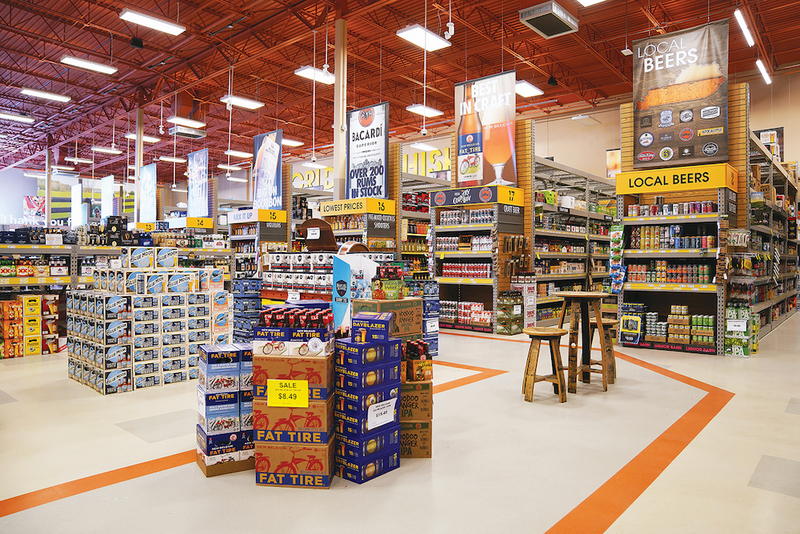 Along with its local flavor and expansive product line, Liquor Barn is distinctive because of its strong commitment to engaging customers and connecting to the surrounding community. The company participates in a large number of events each year and always seeks out the opportunity to do more. Due to the large size of each of its stores, Liquor Barn offers weekly tastings and small events at each of its locations. Many of the stores feature large event spaces, allowing for bigger and more unique activities, and each store generally hosts at least one large-scale event per month. In February, two stores hosted a Chocolate Takeover event featuring chocolate-infused beer, wine and spirits. Representatives from numerous distilleries and breweries were on hand to interact with customers and educate them about the various products. Multiple chocolatiers were also in attendance selling various products. Attendees were charged a $5 admission fee and could enjoy numerous product samples. (The Kentucky Alcoholic Beverage Control Board requires retailers to charge a fee for such events: otherwise Liquor Barn would prefer to make them free for customers). Another annual event held at four store locations is dubbed “How to Derby like a Local.” Held the Thursday before Derby Day, the event gives attendees the opportunity to sample mint juleps (traditionally the derby cocktail of choice), along with a vast selection of Kentucky food, beer and wine. Vendors also sell handmade bow ties and derby hats. “These are the kind of engaging events our customers have come to expect from us, and what really set us apart from the competition,” Edgerton says. Sponsorship is another key aspect of Liquor Barn’s commitment to community engagement. For the past several years, the company has served as the retail sponsor of the Tailspin Ale Fest, one of the top beer festivals in the country. Held in Louisville, the event typically draws about 5,000 people and features more than 200 breweries. The Kentucky Derby Festival is a key event for Liquor Barn, as is the Bourbon Classic, which is also held in Louisville. The Bourbon Classic features tastings, contests and workshops and is another Liquor Barn-sponsored event. Additionally, the company routinely participates in fundraising and other philanthropic activities as a way of giving back to the local community. Recent examples include sponsorship of the Dare to Care Food Bank, USACares, Ronald McDonald House and the Muscular Dystrophy Association. In addition to events, Liquor Barn is also focusing on consumer and employee education. The company currently has seven Certified Cicerones on staff, and they plan to triple that number by the end of 2018. On the wine side, 30 employees are currently undergoing Wine & Spirit Education Trust (WSET) training. The company is also exploring spirit training options for staff, including the Certified Specialist of Spirits (CSS) exam and the Executive Bourbon Steward program. A great example of Liquor Barn employee’s commitment to the business can be found with Williams, who cultivates the stores’ spirits category. A bourbon aficionado, Williams constantly engages with local distilleries and makes site visits to sample dozens of barrels before selecting the few that ultimately make their way back to Liquor Barn. What does the future hold for Liquor Barn? Blue says that Blue Equity plans on being very inquisitive and hopefully growing organically across the state, perhaps expanding into other nearby states as well. Several stores will be renovated in the near future, and there are also plans to bring more innovative processes into the stores, including delivery options. (Drizly, the online liquor store delivery service, is already live at Party Mart locations and will be implemented at several Liquor Barn locations in the coming months). Exciting things are also in the works across the beer and wine categories. Price says he hopes Liquor Barn will be in a position to hosts its own beer festival in the near future. The company is also exploring relationships with local breweries to develop new collaboration brews. On the wine side, Mirt plans on rolling out wine and cheese pairing events in the stores later this year, and also hopes to partner with local restaurants to host wine dinner events. Overall, though, the main focus of Liquor Barn moving forward is constant improvement across all areas. With so many new initiatives in place and a myriad of resources at its disposal, Liquor Barn is certainly up to the challenge. Melissa Sherwin is a freelance writer and marketing communications strategist from Chicago, IL. Her work has appeared in Chicago’s Daily Herald newspaper, Time Out Chicago, Suburban Life newspapers, and various magazines. She is also the author of several children’s books. Follow her @MelissaNSherwin. Read her recent piece, How to Boost Your Tobacco Sales.